A version of this post was originally published in Portuguese as a guest post at Walter Hupsel’s blog On The Rocks @ Yahoo! Brasil. 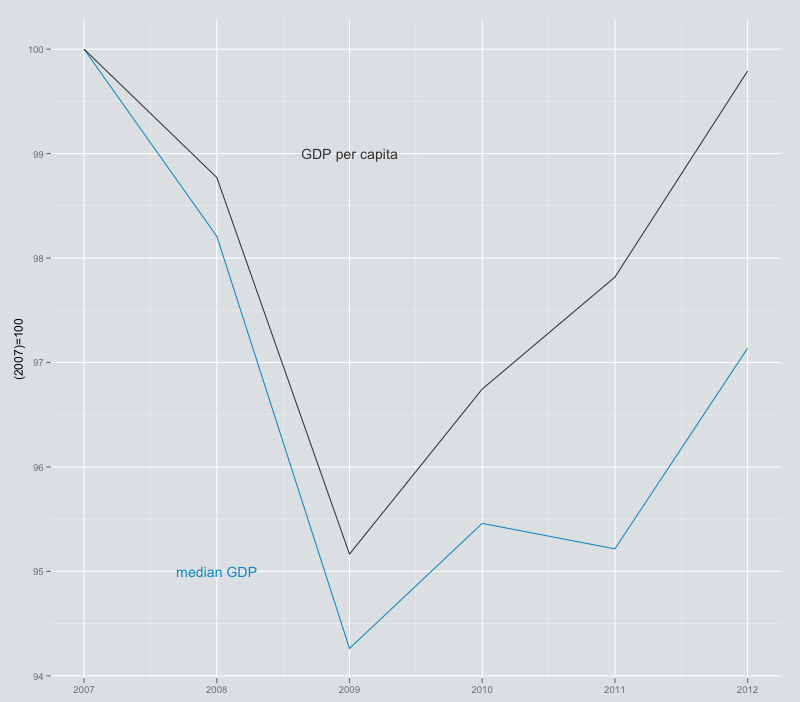 This continues from The mean, the median and the GDP – part I. Using simple arithmetic, the GINI index allows for converting the GDP per capita into the median GDP, assuming that incomes follow a Pareto Distribution. For example, Namibia’s GDP per capita for 2011 is USD 6,3261, however, taking into account its 63.90 GINI index, the median GDP is calculated at USD 2,392 . That is a huge difference. If you tolerate an error up to about 6% in relation to what is expected given a Pareto distribution, you can simply use . Now let’s take a look at Ukraine, with a GDP per capita that is equivalent to Namibia’s in 2011, at USD 6,365. Ukraine has a much better GINI index of 25.62, yielding a median GDP of USD 5,000, more than twice that of Namibia. This is much more consistent with Ukraine’s High human development and Namibia’s Medium human development, according to the Human Development Index, where they stand at the 78th and 128th positions, respectively, and not at the same position, as suggested by GDP per capita. 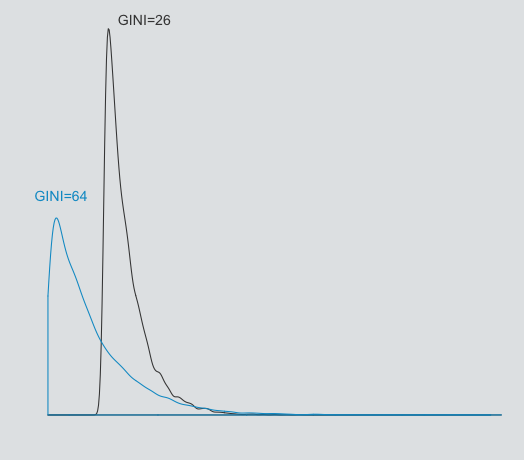 Probability density curves for simulated data with same GDP per capita as mean but much different GINI indexes. Uses log scale. Median GDP can also provide a richer perspective on the progression of GDP of a country and its impact on the population. The USA saw its GDP per capita grow 74% from 1980 to 2012, while its median GDP or mGDP grew somewhat less, at 52%2. Looking at the period from 2007 to 2012, a period encompassing the Great Recession, one gets a picture of full recovery using GDP per capita, while mGDP would show a decrease of almost 3% in the period, still an improvement over the peak of crisis in 2009, but not quite yet the full recovery shown by GDP per capita. Progression of GDP per capita and median GDP for the USA having values for each variable for year 2007 as indexes (=100). As with any indicator, this median GDP measure has its shortcomings. The GINI index, which is required for computation, has lower availability than GDP per capita, sometimes only at 10 year intervals at the WDI database . Nonetheless, some procedures could be adopted to minimize this problem. Since GINI fluctuates somewhat less between years in a country than across countries in a year, using the last available year data can still yield better results for comparing multiples countries than the raw GDP per capita measure . Nowcasting procedures could be used on GINI data available at larger intervals and yet produce nicer long term views of the economy. For countries with no GINI index data at all, mGDP could be set at 63% of GDP per capita, assuming the median GINI index of 41. Its adoption will certainly require some work to improve data availability, quality and comparability, a challenge even for the ever present GDP, as Bill Gates made the case recently . All of us who make a living out of statistics know that they can become an adverse influence on policy. When we focus on GDP per capita, we are taking into account a non-existing person, focusing on a measure that can improve regardless of what happens to the bulk of the population (i.e., the mean actually represents nobody instead of the average of everyone). We should be focusing instead on the mythical average Joe or Joana or Tomihiro or Neo, the one figure that divides the population in the middle, the one that only changes if a good chunk of the population does, and that’s what mGDP can show us. If we start to see this number on the home page of World Bank, or brilliantly promoted by Roslings’ Gapminder, or perhaps on the cover of The Guardian, perhaps we can hope that policies may be at least a little bit diverted towards the bulk of the population of our countries. Some data tables, R scripts and a view of similar and equivalent approaches is next on this series. I kindly thank comments and suggestions received from Andre Luchine, Beto Boullosa, Camilo Telles, Eduardo Viotti, Emilia Spitz, Joniel da Silva, Leonardo Fialho, René Dvorak, Vini Pitta and Walter Hupsel. 1. Unless otherwise noted, all figures from World Development Indicators, access on December, 31st , 2013. Indicators: GDP per capita, PPP (constant 2005 international $): NY.GDP.PCAP.PP.KD; GINI:SI.POV.GINI, latest available year.